* Deficiencies in the Geological Investigation: ADEQ’s findings confirm the presence of Karst hydrogeology at the C & H site and surrounding area which allows groundwater to flow through interconnected underground fissures and cracks and into aquifers which are extremely vulnerable to contamination. * Water Quality Issues: ADEQ’s findings confirm two sections of Big Creek in Newton County and two sections of the Buffalo National River are now impaired due to the presence of pathogens and low levels of dissolved oxygen. CAFO a Reg. 5. Dye tracing has documented that underground streams which may be hydrologically connected to C&H activities have allowed residential water wells to be contaminated. Anglers continue to see massive algal blooms in the Buffalo National River which are confirmed to include dangerous cyanotoxins. The presence of these algal blooms and related toxins are not only a threat to public health but are also a threat to the $70+ million contribution the Buffalo National River provides to Arkansas’s economy and in particular to those counties which border the river. Sound science supports the permit denial and reaffirms the position of tens of thousands of concerned citizens dedicated to the protection of the Buffalo National River. 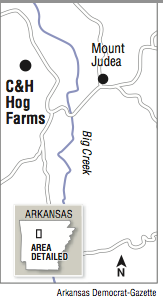 Please submit your comments (http://water.adeq.commentinput.com/?id=m45xxd) in support of ADEQ’s denial of the permit for C&H Hog CAFO in the Buffalo National River watershed by October 17th.